Do you love brunch? Do you love a challenging but engaging workout? Look no further than UPSIDEdown insideOUT Yoga & Brunch happening the first Saturday of every month at insideOUT in Hillcrest! Last weekend, I was fortunate enough, along with 50 other people, to experience the event first hand inside (technically outside) San Diego’s only urban oasis! Here’s why this event will elevate your soul! 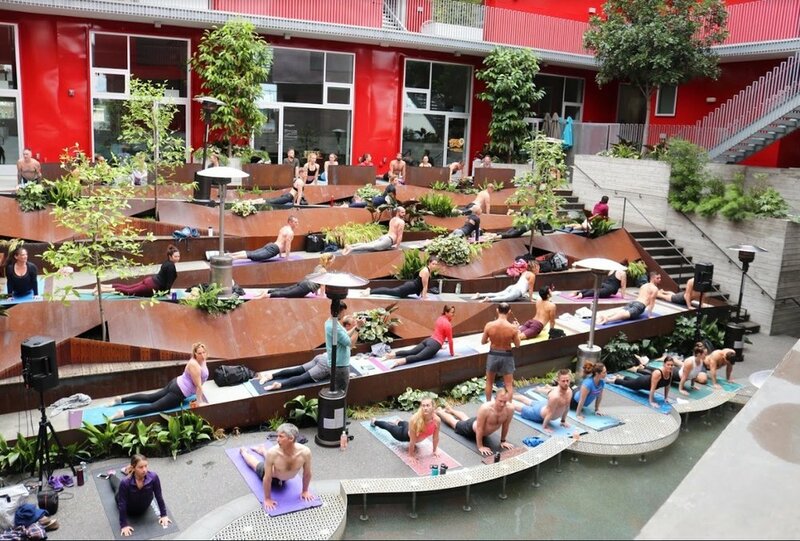 This isn’t your typical quiet, peaceful, meditative yoga class. Not that there is anything wrong with that but if you’re planning on devouring insideOUT’s open-faced steak and eggs sandwich or their sweet and filling French toast after yoga, you gutta work for it honey! I had never done a CorePower Yoga class before so I wasn’t fully ready for the booty-kick that commenced but boy was I grateful! The workout was challenging with not only dynamic flows but sprinkles of cardio to really get your heart pumping! It felt so rewarding to push my body and empowered me to take on any challenge that came my way that day! From what my table mates said, Corepower Yoga instructor Andre Houle has a “cult” like following and I can totally understand why. Andre works you to your absolute core, no pun intended and builds you up with his inspiring and motivational words. I definitely felt the L.O.V.E. in the air as 50 people harmoniously sweat, cried (maybe that was just me) and accomplished something great together. Executive Chef MJ showcases elevated California Mediterranean inspired brunch fare to fuel your body after the workout. One of the most popular dishes at my table, the quinoa hash bowl with soy chorizo, roasted vegetables, and two poached eggs is just the right amount of protein for your hungry muscles to recuperate but is also incredibly delicious. If you want something sweet then go ahead and #treatyoself with MJ’s luscious French toast topped with berries, mouth-watering vanilla cream, and white dust because you earned it. Each ticket comes with an Áperol spritz but you’ll be ordering additional cocktails when you start to read the menu developed by mixologist and co-owner Moe Girton! I couldn’t help myself, I just had to order the Rosè and Rose. Maybe it was the zen energy from the yoga or the waterfall in the atrium, but it just felt like the right moment to order a refreshing glass of bubbles topped with rose-water. Just when this event couldn’t get any better insideOUT has partnered with retailer and sportswear designer Athleta. Athleta was there to support the community as well as hand out some fun goodies to the event attendees. I got a fun and sparkly swag bag and was one of the lucky attendees to receive a $50.00 gift card to their UTC location! Whoop, whoop! I can’t wait to get some new yoga gear for the next UPSIDEdown insideOUT Yoga & Brunch. So, if you don’t have plans on Saturday, March 2nd, I highly suggest you grab a ticket to the next UPSIDEdown insideOUT Yoga & Brunch! 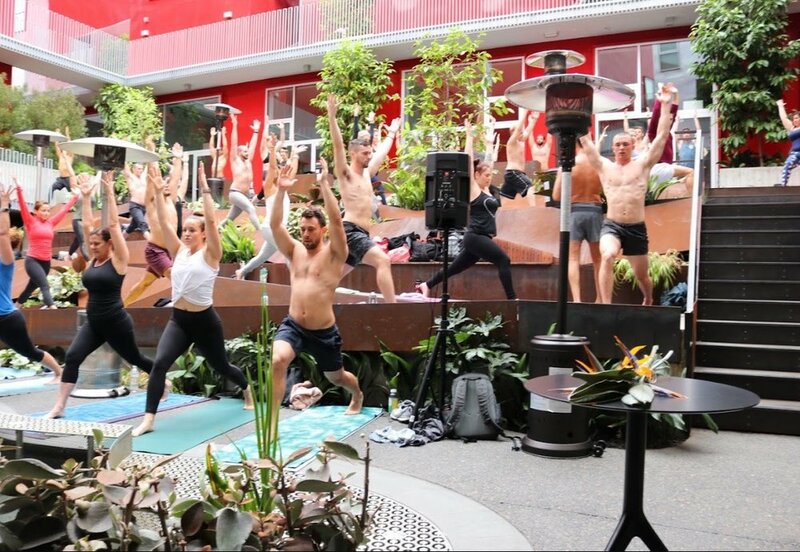 A challenging and dynamic workout lead by a passionate and motivational teacher, followed by a craft cocktail and brunch dish to satisfy your morning, this event will become a part of your monthly regimen!